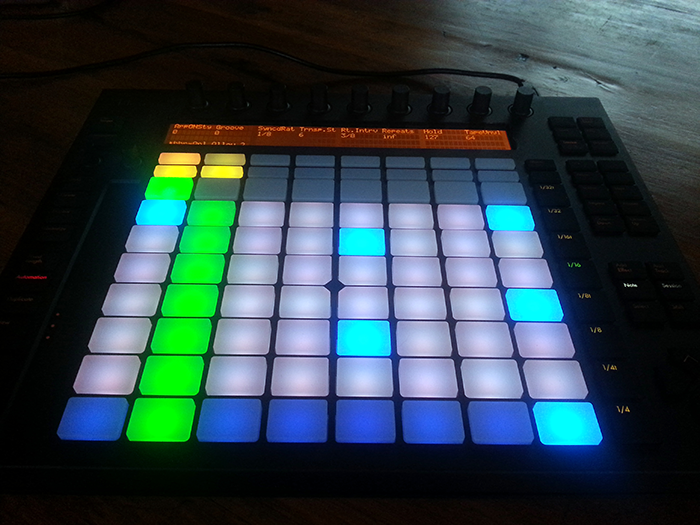 After my Ableton Certification in November 2013, it was time to explore Ableton’s brand new flagship controller – the Ableton Push, engineered by Akai Professional. After unboxing the Push, the sheer weight (approximately 4.4 kg) to the smooth but sturdy touch-sensitive encoder knobs and the rock-solid RGB 8 x 8 velocity sensitive LED pads gave me the impression that this is a controller that was built to last. So to say that I was excited was quite a gross understatement. I placed it next to my APC40 to get an idea of it’s dimensions in regards to my gig bag and I was happy to see that the Push was a slightly smaller design and more compact (480.06 x 137.16 x 375.92 mm). I knew that this would make a big difference for live performances and the best part was that it’s a USB bus powered device. No more looking around for an adequate power source close enough to your machine at performance venues and no more having to pack an extra power adapter. However the Push does come with the option of using it’s power supply for the purpose of enhancing the brightness of the LED pads for performances in daylight. 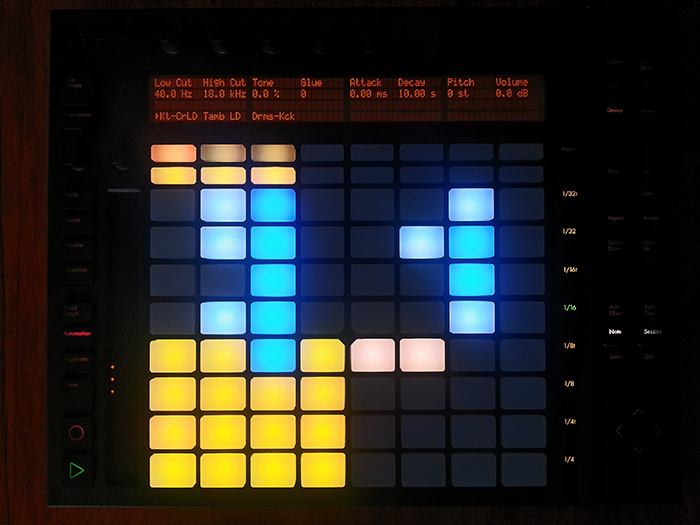 Upon switching on the device and having a new session open in Live 9, the 8 x 8 grid lit right up. As I glanced at the various buttons on ether side of the controller I wanted to get an idea of just how detailed the functionality of the device would be, I was quite impressed and it was time to explore. On the top right hand side are the mode buttons that change the functions of the endless rotary encoders. Volume – shows all the volume levels of all your channels in the display window and upon touching the respective (volume) encoder your decibel level of your channels would appear. 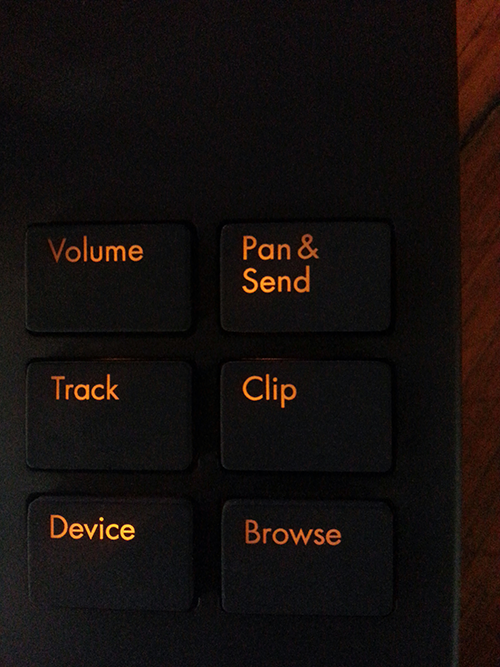 Pan & Send – toggles between your pan and various sends, depending on the number of return tracks available in your session. While Track – gives you the option to display the details of a single track in order to adjust the volume, pan and send settings simultaneously. Clip – displays all the various loop settings; the Start – the starting point of the clip, Position – the position of your loop bracket, Length – the length of the loop and Loop on/off in both midi and audio clips, with the added Warp Mode, Detune, Transpose and Gain information in the latter. By pressing Device, I was able to view all of a device’s parameters in a selected track. But it was when I pressed Browse that I came to the understanding that I am looking at the perfect integration of the Live 9 browser, which means for the first time composing digital electronic music, I truly am free from the clutches of my laptop! No more making music with the laborious feeling of working on some spreadsheet. I can add drum racks, instrument racks, audio and midi effects. Everything that is available in the Live 9 browser was now at my fingertips. I was very pleased to see that the basic editing buttons were added to the Push controller, such as; Undo, Delete, Quantize and Double. This was possibly subject to Ableton and Akai becoming aware of these features being available in the devices of their competitors. Never the less, all the more reason to leave the laptop alone and make music. Being an owner of an Akai APC40 I witnessed a few similarities between the two controllers. Both are equipped with directional arrow buttons to navigate your grid rectangle in Live’s interface, Tap Tempo – to tap and set a specific tempo, Shift – for second functions or added resolution for encoders and Metronome – to turn the metronome on or off. 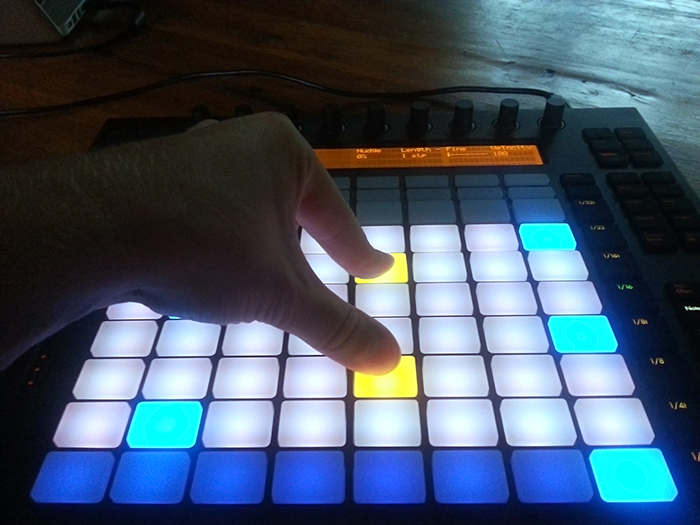 After browsing and adding an 808 drum kit in my first track the 8 x 8 LED grid now transformed to three distinct sections with the bottom left corner 4 x 4 area displaying each drum rack pad in yellow with the selected pad in blue. I could now record all the different drum sounds by either pressing the record button and playing the velocity sensitive pads, or selecting a drum rack pad and using the top 8 x 4 grid to sequence a drum pattern in any note value chosen from the note subdivision buttons on the right hand side. Ranging from 32 note triplets all the way through to 1/4 notes. When I had my drum pattern recorded my eyes shifted to the bottom right 4 x 4 section of LED pads. I realised that each pad is representing a bar of music and the respective pad would turn green to indicate the section of the pattern being played. This made editing, navigating and expanding upon my drum groove very simple and efficient. By double tapping on one of the navigation pads in the bottom right I could select any specific bar I wanted to edit, or by pressing and holding one pad and then other in the 4 x 4 loop selection grid I could select the number of bars I wanted the pattern to be. I then decided to start experimenting with the Repeat button on the open and closed high hats. This allowed me to press and hold any drum pad to repeat the note based on the subdivision selected. Repeat can be used in two ways, as a momentary switch when pressed and held down or as an on/off toggle when pressed quickly. With further exploration of this function I started to understand that not only are the LED pads velocity sensitive but they respond to pressure as well and this made for quite an interesting amalgamation between a human and a programmed feel. My hi hat patterns were quite close to what I had in mind except for one core element that was missing, the swing amount. With a slight adjustment to the Swing encoder on the left side of the Push, a sudden depth of groove was emerging from an otherwise very straight pattern. By holding down any respective pad I was able to dial in different swing amounts to each element of my kit that I could then record. This revelation sparked even further intricacy in the pattern development and with that, I dialed in the perfect groove. With my drums sounding solid I decided to move on to my bass, melodic and harmonic elements. I quickly started to dig through bass sounds and found a bass patch in Collision to work with. 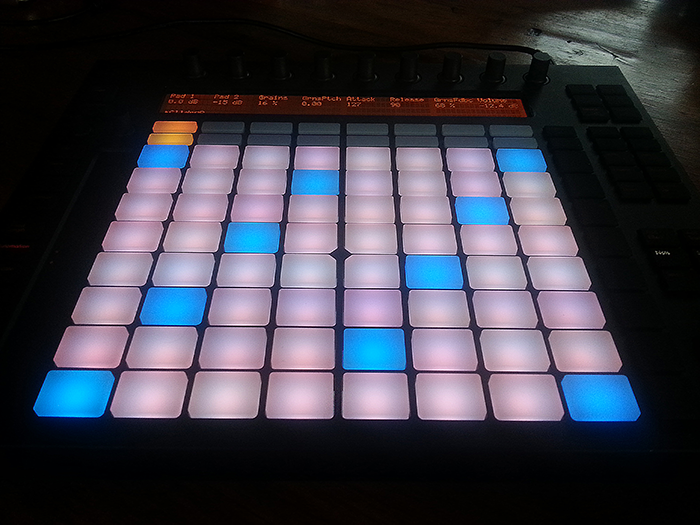 Upon loading a melodic instrument on the Push, the 8 x 8 grid now changed it’s layout to a series of white and blue pads. Each blue pad signified the root of the scale, while the white pads were other degrees in the specific key and pads being pressed would turn green. I decided that I liked the sound but wanted to change the key of the instrument and did so with ease by pressing Scales. The visual display now indicated the key I was in and I could now use the track selector buttons to select a different key and scale. For those of you that have an understanding of music theory and Jazz modes, are in for a treat because Ableton has provided all the different scale modes and some vibrant Middle Eastern, Asian and Blues scales to name a few. I also unveiled the option to put the grid interface in a chromatic mode by pressing one of the track selector buttons marked In Key. This will be used to play a piece of music that might have passing tones or to have the ability to change keys while playing. I started to improvise with some ideas in G Minor and saw that in order to play a scale, the grid was set up in groupings of 3 pads per row moving from left to right and upward. The interesting realisation was that the Push would also indicate other pads on the grid that would produce the same note marked in green. Thus, when paying different chord shapes one would be able to possibly find more efficient ways of voicing them. I found that this relates quite closely to the layout of a guitar fretboard. Therefore when a specific shape is internalised and understood by the musician in one key, it can be applied in any key, unlike a piano, because of the layout of sharps and flats on a keyboard (the black notes). I got to the stage where I was ready to record my bass line and held down the Fixed Length button. A recording length menu appeared and I could determine the amount of bars I wanted my bass line to be using the track selector buttons. I found that this was a testament to the functional design of the Push, when recording ideas that were being played by hand. I could now focus on my musical performance and not worry about pressing record at the right time for Live to determine my loop length. After recording my bass line, there were some rough edges to some of the notes in regards to time keeping. 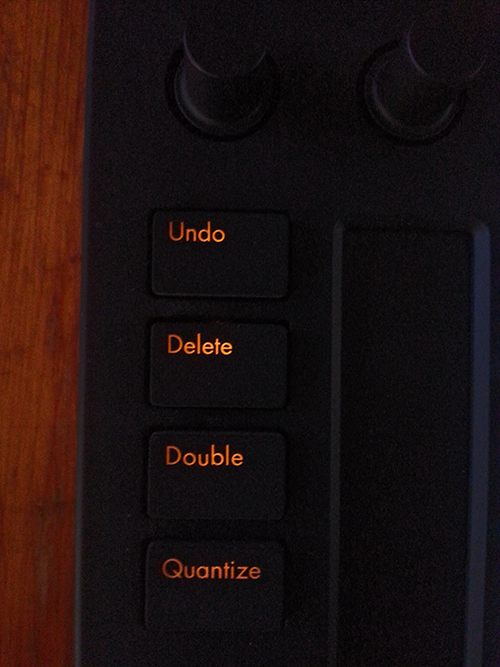 I saw a Quantize button and although not wanting a robotic bass line, I pressed and held down Quantize, and low and behold – a quantize menu with an array of settings. Here I could set the Swing Amount, Quantize To (Note Value), Quantize Amount and Record Quantize. After I had made my adjustments I released and pressed the button quickly to enable my settings. This allowed me to nudge notes that are a little out of time closer to the grid without loosing the human feel. Once my bass line idea was solidified, the pitch bend function on the touch strip provided me with additional expression by sliding the end of certain musical phrases. I then found that I was happy with the notation side of the bass line loop, but felt it needed more movement in it’s sonic texture. This brings me to one of the biggest developmental improvements and one of the most requested features in the transition from Ableton Live 8 to Live 9, (inserts drum roll) Session Automation. I had spent quite a bit of time using Session Automation in Live 9 and was excited to see how it was integrated with the Push. After pressing Device to view the Operator parameters and making sure the Automation button is illuminated, my track was armed and I pressed record. I then started to open and close the filter frequency and play with the decay, amongst other parameters. Within seconds I got a feel for the workflow and relationship between the Push and Live 9. As easily as I could record automation changes, I could discard or override them and finally found myself channeling musical ideas with no distraction of a computer. I was filtering through hundreds of ideas in a very short time period and stumbled upon a keeper. It was time to add a new melodic layer and so far I had a well defined drum pattern and legato bass line. I wanted to add a syncopated guitar element to strengthen the rhythmical concept of the piece as well as to contrast the sustained notes of my bass line. Whilst attending a Push demo by Berlin based Ableton Certified Trainer, Jesse Abayomi, he explained a new Melodic Step Sequencing function in Note mode in Live 9.1. By pressing the Note whilst already in Note mode, the 8 x 8 LED grid now turned to a group of dimly lit grey rows, each representing a specific pitch with one blue row representing the root note of the key. I was now able to use the note subdivision buttons to change the grid note value, exactly like step sequencing a drum pattern but with a melodic instrument. With the use of the Touch Strip I could scroll along the the piano roll of the synthesizer. I have had prior experience converting my APC 40 to a melodic step sequencer with the use of Hanz Petrov’s Midi remote script entitled the APC 64-40. On the surface, comparing the APC 64-40 remote script and using the Push controller as a melodic step sequencer rendered quite a similar feel. This got me investigating and finding that there was speculation on whether Hanz Petrov was part of the developmental process of the Push. However upon closer inspection the Push had far more hidden features that had the ability to create many more intricacies of expression, I’ll explain. As I started placing my notes in the sequence grid, the selections I made would turn dark blue. I had a look at the top row of the 8 x 8 LED pads that where marked in white. These pads represented every bar in the sequence and would turn green indicating the loop playhead. I was able to adjust the loop length to a single bar by double tapping a pad or a number of bars pressing and holding a pad and then selecting another. By pressing any of these pads once, the selection would turn light yellow, which indicated the specific bar in the loop that I was on and able to edit, while my sequence kept playing uninterrupted. I managed to put together a tastefully syncopated muted guitar chordal part but wanted a looser feel out of the sequence I had composed. I felt that I needed to break away from all the notes being exactly the same length and perfectly placed on the grid. This is where the melodic step sequencer of the Push was far more superior to that of the APC 64-40 that I was so accustomed to. I could simply select a note/s that I wanted to edit by pressing and holding the existing blue pads till they turned dark yellow. The display would change and four parameter settings would appear. Nudge – to move notes off grid to the left for a more rushed feel or to the right for a looser feel. Length – to adjust the note length per steps and visually be represented in the grid when notes are elongated or shortened. Fine – for editing note length, but with a much higher resolution value for micro adjustments. Velocity – for editing the note velocity that changes the pad selection to a darker or lighter blue depending on the amount. This editing feature allowed me to refine my sequence and give it much more depth, transforming my idea into a musical phrase. Once I was happy with the notation of my guitar part, it was time to expand upon it’s sonic texture with effects. I could do this by simply pressing Add Effect and browsing for the desired device. I felt an Auto Filter would be sufficient and started to experiment. I wanted each note of my phrase to be at a different frequency selection of the Auto Filter. I tried using the standard way of recording automation by hand, but it didn’t give me the desired effect. Then discovering that when in Melodic Sequencer Mode I could select the note/s I wanted to edit by pressing and holding the pads and a menu would appear. In the menu, Notes (which I used for refined editing) and Automation. When I selected Automation, my device parameters for my Auto Filter reappeared and now I could make adjustments to my selected notes with surgical precision. Once a parameter was edited with Step Automation a small block would appear next to the name of that specific parameter. Having a look at my laptop screen, I could see my adjustments being made in realtime on the midi clip. I uncovered that I could select sections of the sequence grid that weren’t voiced as notes and could still make automation adjustments. This was intriguing when working with longer note values. I was able to make adjustments after a note was voiced to give it a chopped filter effect and wasn’t bound to the note values of my phrase. Smaller or larger note values could be selected for automation sequencing with the note subdivision buttons and without effecting my notated step sequence. My automation data could be overridden by adjusting the selected parameter encoder. 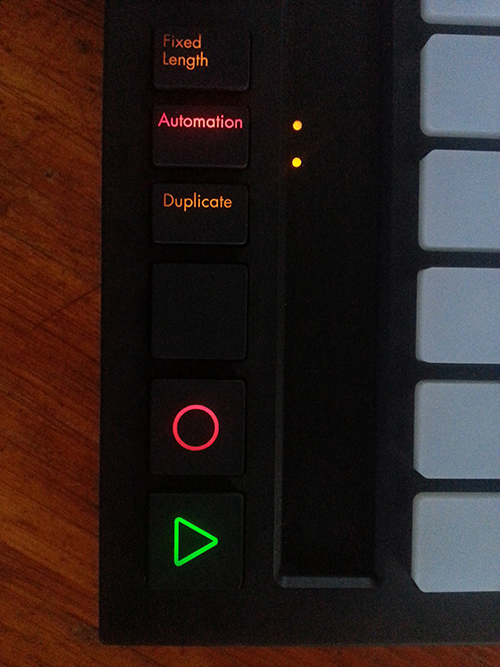 To re-enable my automation I could simply hold down Shift and press Automation. I approached my arrangement in order to piece together the song structure. By pressing Session, the 8 x 8 grid now displayed all my clips that I had recorded and the note subdivision buttons were now used to launch scenes. This would be a familiar sight for anyone that has had experience with traditional clip launching grid controllers. I made duplicates and variations to my some of my clips with use of Duplicate. I wanted to create a different bass line for the B section of my song for some variation. So I selected my bass track when pressing New, to only duplicate the clips from the other tracks in the scene and leave an empty clip slot open to allow me to create a new part without stopping audio playback. Now with all my parts ready to record to my arrangement, I had to approach my laptop for the first time during the entire session. It was a true refinement of musical flow. 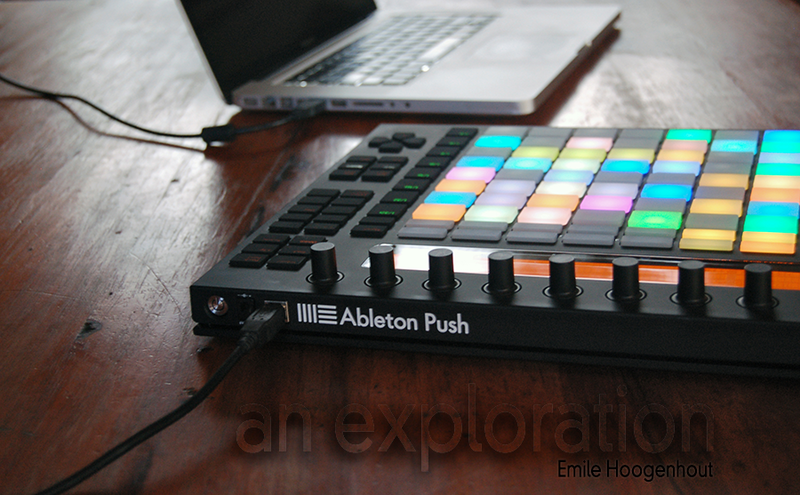 It is very clear to me that the Ableton Push is not just another midi controller. It was specifically designed to be a musical instrument, with playing and improvisation as it’s core. In terms of mixing and mastering there are many actions you will still be able to perform without the use of your computer, however this is not the focal point of the Push. One of the most fundamental elements in the Ableton universe is it’s user community. The symbiotic relationship between Ableton and it’s users sparks growth to the evolution of Live and Push. 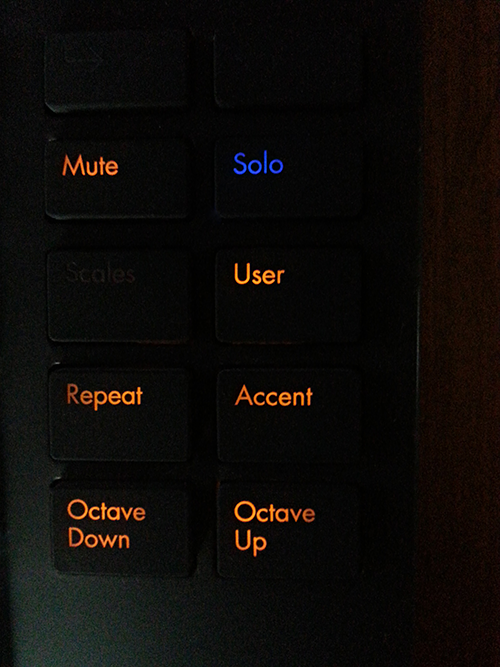 Numerous developments in customized midi remote scripts to allow further functionality have seen the light of day. 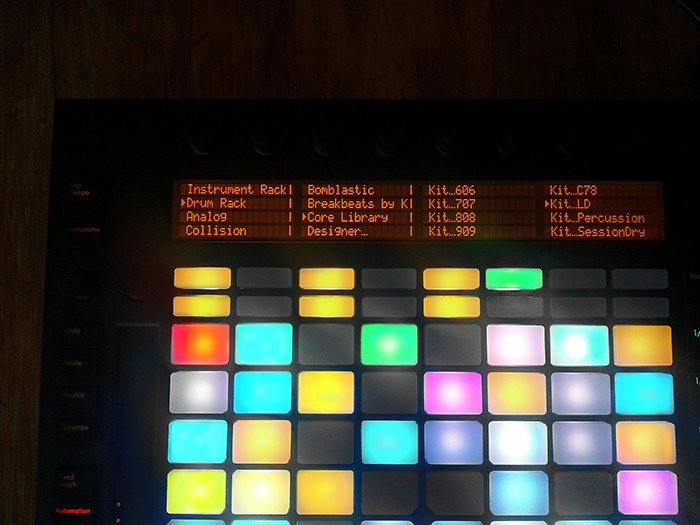 For example, PXT Live by Native Kontrol – which I have explored and highly recommend. 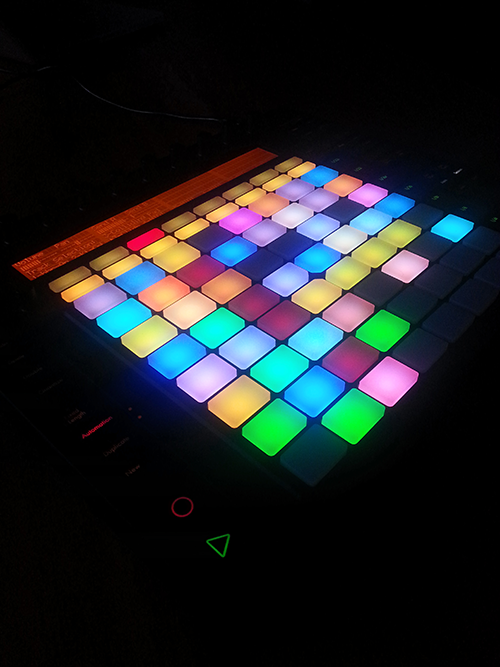 PXT has capabilities similar to the MLR application on a Monome controller. For those of you that haven’t had any experience with MLR – it is a live sampling-cutting platform on a grid based controller. Although the User mode for personal midi mapping is quite limited at the moment, PXT expands the functionality of the Push and only resides therein. This gives you the ability to easily flip between PXT Live and the default Push functionality. Another Ableton Certified Trainer that has done some extensive research on the Push is Julien Bayle. If you are interested in the advance uses of midi remote scripts, I highly recommend checking out his website. As Ableton Live and Push is ever evolving and the rate at which knowledge and information is exchanged openly, we are truly living in exciting times. I just bought Push. This will encourage me to sample at last some great instruments I have here, including one giant electric bass mbira from Congo (http://cdn2.pitchfork.com/news/54976/ed21e7fd.jpg). I also have two mbiras from Zimbabwe, including one with a gourd resonator, but I doubt I would enjoy their sampled sound since instead of being slightly different each time, the rattling would be exactly the same on each hit, which would quickly become boring. Unless I sample each tine many times for each velocity level and have the samples triggered at random for more variety. Maybe that’s possible in Simpler, I’m only scratching the surface of Live coming from 20 years of using Logic. My question will sound totally noob to you, but anyway here goes : from within Push, can you set up the pads so any one of them can be assigned to any midi note ?